yell at Kevin whenever he mentions it looks nice and/or that I am making progress. Tell him he knows nothing and that I am the worst designer EVER. Realise that I actually do love the design and that maybe I am not the worst designer in the world. Funnily enough, I never hit 6 and 7 with this sweet little cropped cardigan. Though quite different than what I would normally design, the puff sleeves and deeply ribbed waistband flew off the hook with little accompanying sturm und drang. This retro-inspired top has all the elements you need to make a statement. The lace panels are echoed at the collar, cuffs and the waist, which is gathered to create an elegant shape. 28 (28, 29, 29, 30, 30, 30, 31) buttons 1cm/0.5in diameter. Back and fronts of cardigan are worked seamlessly down from beg chain at shoulders then joined under the arms and worked in rows back and forth to the hemline. Neck edging is worked separately and sewn on. Today I wanted to feature another stitch that I love. I found this stitch in a Japanese crochet stitch dictionary and played around with where I could use it for some time. I originally planned it as a big puffy wrap, and it still may become that one day, but the more I worked with it the more I loved the idea of using it as an edging for a wedding shawl with the way the stitches reminded me of wedding bells. I am calling it the cable and shell wave, but I have seen a different variation referred to as the wheat stitch. Either way, its a wavy cable with puff or shell stitches in the middle. I have used it in the Wedding Bells Shawl from Hook, Stitch & Give, but I've seen it (or a variation of it) in a number of other projects, including Sassy SSS' Wheat Stitch Baby Blanket and Joanne's Gnarled Bark Hat for The Crochet Project. Once you get the basic idea of the travelling cables, its a great stitch to play around with, as the central stitches are easy to switch out for something else and you can add or subtract cables. For the version I have outlined below, you'd need a starting chain of a multiple of 12, but if you would need to add or subtract stitches if you were adding more cables to the design. Hello! We made it back late last night from the most incredible week in Orkney. Its a good thing I love where we live or else I wouldn't have come back. Exactly what we needed. However, its back to the grindstone today before I jet off to the South Coast of England for work. Only its not a grindstone at all, really, as we have very exciting things happening! Joanne and I are thrilled to announce a new Crochet Project design in partnership with Love Crochet.com. Inspired by the beautiful tumbling waves of leaves on a mature Acer tree this pretty patterned shawl is deceptively simple to make. Worked in ever increasing rows so there is no long foundation chain, the size is easily adaptable – just work more or fewer rows. Love Crochet will be hosting a crochet along in September, but if you are desperate to get started, you can find the pattern here. Inspiration for designs comes in many forms. Sometimes, its a garment I've seen in real life or on TV, sometimes its a construction method or stitch pattern. For my latest pattern, the inspiration came from the yarn itself. If you have Hook, Stitch & Give, you will know that I am a huge fan of Ripples Crafts yarn. It features in at least 2 projects - the shell scape shawl and the thrummed mittens. Helen, who also lives in rural Scotland, creates colours that really speak to me on gorgeous bases. I simply can't get enough. And when I saw her Stormy Seas colourway in 4ply BFL at Woolfest, it had to come home with me. Originally intended for a shawl, the yarn sat on my desk for a few weeks convincing me it needed to be a ripple cardigan. Now, ripples are beautiful things - one of the elements that crochet does so well- but shaping in ripples is...ah...difficult. And grading across a large number of sizes like that is a nightmare. So simple ripple panels are added to this to give the sense and texture of ripples, but with the ease of shaping in UK trebles and doubles. The pattern is sized from 0-6months to 10 years. It has seamless set in sleeves that are created by using short rows - which are easy to do once you get the hang of it, promise. This cardigan would work well in any 4ply or sock yarn. In fact, sock yarns are great for kid's clothes as they are very hard wearing and washable. You will get up to a size 4y in 2x100g hanks of sock yarn (and you won't be far off a 6y if you shorten the hem to underarm length). You can find the pattern on Ravelry in both UK and US terms. Georgia wanted me to make sure that "the people on the computer" know that this is her cardigan and her name is Georgia. This sweet little wrap originally appeared in Simply Crochet Issue 13. Its a take on a basic ripple pattern, but uses varying heights of stitches to create the wrap shape of narrower at the top and wider around the shoulders. Its designed for a 4ply yarn, but you could really make it in any yarn and adjust the number of row repeats for a wider wrap. Its also easily made longer, but simply chaining additional stitches in multiples of 17. The design is worked out in 2 parts from the beginning chain at the centre of the back, which creates a gorgeous ripple effect running down the back of the wrap. Its easily one of my favourite designs of last year. The only tricky stitch is the Front Post Single Crochet (raised double crochet front). I'll have a tutorial on the blog on monday to help anyone who may struggle with this awesome little stitch. Its currently free to download here for the US version and here for the UK version exclusively on Slugs for the next wee while!! Its no secret that I love puff stitches. They and their slightly more structured cousin bobble stitches feature heavily in my books and designs. They are just so fat and cozy, don't you think? They add weight and substance to crochet fabric that can sometimes be a bit too lacy. This weekend, upon finishing a deadline garment with little puff stitches at the collar, I was itching to continue the theme. With a lot of Libby Summer's Fine Aran to use, I decided a throw for our bed would be the perfect mindless between deadlines project. Each Hexy was designed to use almost exactly 25g of worsted/DK weight yarn (the libby summers is a fine- aran, so not terribly far off a thickish DK). The alpaca in the wool gives it a glorious drape that is going to be perfect for snuggling under. If I haven't already converted you to the glory of puff stitches, let me try now. 2. Insert hook into stitch (or in this case space), yarn over and pull through. 3. Work steps 1 &2 a total of 5 times. 11 loops on hook. Can be worked in any yarn with appropriate hook, but size of hexagons will be affected. Ch5. Join in the round with a slst. Your hexies don't have to be a blanket - make them in bulky cotton yarn for a trivet or pot holder or join in one long strip for a scarf. Today's pattern is by the very talented Libby Summers. K2tog- Knit two stitches together, insert needle as to knit through the next two sts on the needle, knit them as one stitch. With wrong side facing you, place back piece on top of front piece, making sure that cast off edge of back piece comes above the six rows of garter stitch at end of front piece. Pin in place. Sew pieces together using back stitch, leaving flap opening. Turn right side out. Welcome to Week 2 of Knit Camp. 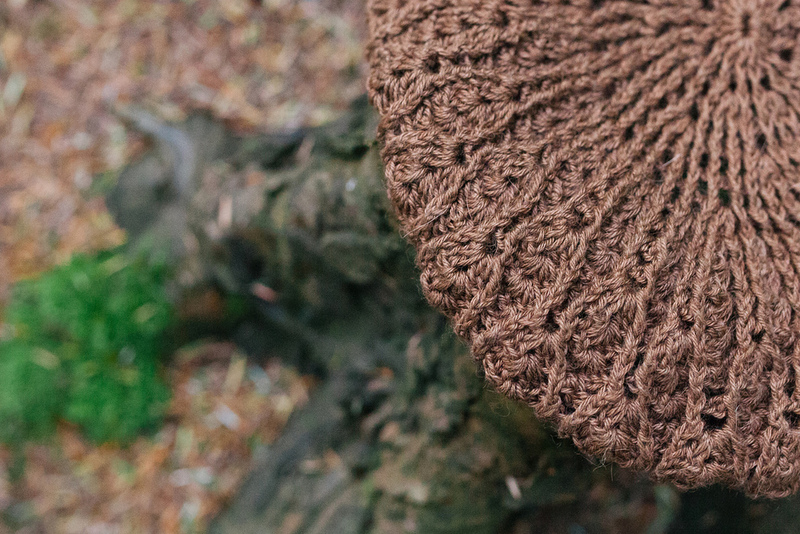 This week, we are woking through this stripey hat, designed by Joanne Scrace. We will also be covering: How to Read Knitting Patterns, Tension, Decreasing and Casting Off. Don't feel like you have to *get* everything in this pattern from the beginning. We will be working through the sections as we go this week. Remember, the tutorials will be online forever more, so you can work through them at your own pace. K2tog – Knit two stitches together. Insert needle as to knit through the next two sts on the needle, knit them as one stitch. SSK – slip, slip, knit. Insert needle into next stitch as if to knit it, slip it onto the other needle without knitting it, do the same to the next stitch, insert your needle through the back of the two sts just slipped and knit them together as one stitch. Using the MC, cast on 90 sts. Row 1(RS): *K2, p2; repeat from * to last 2, k2. Row 2: K1, p1, *k2, p2; rep from * to last 4 sts, k2, p1, k1. Rows 3-10: As rows 1 and 2. Row 12: K1, purl to last st, k1. Row 13 - 16: Change to CC, work as rows 11 and 12. Rows 17 – 18: Change to MC, work as rows 11 and 12. Rows 19 – 20: Change to CC, work as rows 11 and 12. Rows 21-22: Change to MC, work as rows 11 and 12. Rows 23 – 24: Change to CC, work as rows 11 and 12. Break CC yarn leaving tail long enough to weave in. Rows 25 – 36: Change to MC, work as rows 11 and 12. Row 38 and all even rows: As Row 12. Break yarn, leaving a long tail (almost as long as your arm). Thread the tail with a darning needle, and weave it through the remaining sts then pull them off the needle. Pull tight and fasten with a stitch. With wrong sides together and using 1 st on each side as a selvedge seam the hat. Weave in all ends. Wash and leave to dry flat. About the Pattern: Let the swatch became the design! Worked sideways, these mitts use only knit and purl to create a warm and easy-to-make set. Cast on 30 sts, leaving a 30cm/12in tail. Row 4(WS): K8, p18, k4. Row 6: K8, p18, k4. Work rows 5 & 6 a total of 21 times. Cast off all stitches. Break yarn, leaving a 30cm/12in tail. Fold mitts in half width-wise with right sides together. Using tail, sew up the seam 5cm/2in down from top cuff. Break yarn, weave in ends. Sew up 6 cm/ 2.5in from the bottom cuff. Break yarn, weave in ends. You may want to place stitch markers to mark off the purl section you need to do on the even rows 6 - 46. Want to know all about stitch markers? Lion Brand has a great post here. Confused about pattern reading? Think of it like a code. Where the row instruction says "Knit" that means knit all of the stitches all the way across. As this pattern is written for rows, you will turn your knitting at the end of each row. We won't be going into Finishing and Sewing up on this course (we will be covering casting off though!). Knitty.com has a thorough tutorial on sewing in your ends. A basic whip stitch will be fine for sewing up your mitts, but if you want a more invisible seam, Knitty also has a great tutorial on invisible seams. 1 x 25g ball of DK Yarn) in white. [yarn over, insert hook into stitch, yarn over and pull through stitch, yarn over and pull through 2 loops] 3 times, yarn over and pull through all the loops on your hook. 5 ch, slst into the 1st ch, [5 ch, slst into the same ch as the 1st slst] twice. Working into a magic loop, 1 ch, 6 dc. Join. Block lightly, for best results, pin each of the picot points to let dry into shape. For making bunting, 20 ch, [1 dc into the central picot point on one snowflake, 25 ch] repeat for as many snowflakes as you have made. Need help? Head over to the awesome Crochet Camp Facebook Group! Want to learn to knit in the new year? Check out Knit Camp! In the last few months, I have designed no less than 7 different star patterns. While I am known to go on crazy pattern binges where I design the same thing over and over, this star obsession sort of takes the cake. I will be publishing 2 different patterns this week and I have a different pattern in my Crochet A Star Garland kit, plus the star rug in my book as well. I think 4 star patterns in a life time is probably enough. Today's pattern is for the most basic of stars. Tomorrow we will tackle the tricky ones! Yarn + appropriate hook. Mine is in DK, but try crochet cotton for lovely dainty stars or thick yarn for ones that pack a punch. Step 1: Starting with a slip knot on your hook, chain 2. Step 2: Insert your hook back into the very first chain you made, make 1 double crochet (dc), chain (ch) 2. Step 3: Repeat step 2 a total of 5 times, working into that very same chain you worked your first double crochet into. Step 4: Join with a slip stitch (slst) into the top of the 1st dc [ you should have 5 double crochet stitches in total]. For teeny stars, stop here, break yarn and weave in ends. For weeny stars, continue on to round 3. Step 7: Make 1 chain. Step 8: Miss 2 double crochet stitches. Work 2 double crochet, 3 chain, 2 double crochet into the next chain space. Miss 2 double crochet and slip stitch into the space between the stitches. Step 9: Repeat step 9 for each chain space around. You will have 5 points. Your last slst is worked into the 1st chain of the round [20 double crochet stitches and 5 slip stitches in total]. Break yarn, weave in ends. To get nice pointy finishes on your star, lightly wet and pin each of the corners out to dry. String a piece of ribbon into the corner of one star and tie them onto the tree. String them together for bunting by chaining a length and working a double crochet into a point to secure them to the chain. Today, we continue Crochet Camp: Christmas Edition with a wee wreath. This is super easy and like all of the patterns this week, can be made with any yarn you have - lighter weight yarn will produce a lacier effect and something like T-shirt yarn will make a real statement piece. The only consideration here is that you should be using a hook a few sizes smaller than you normally would for the yarn to get a tighter gauge. This will ensure your wreath keeps its shape. I use embroidery hoops for these, but there is no reason you can't use any hoop-like object - from a bracelet to a hoola hoop- the basic principle is the same. 2x 25g bulky weight wool in required colours. Start with a slip knot on your hook. Insert hook through the hoop, yarn over hook and pull through hool and the loop on hook to secure the yarn to the hoop. Working around the hoop, double crochet around until all of the space around the hoop is covered. End with a stitch count that is a multiple of 3. The double crochet can be slightly tricky to get the hang of, but it really is no more difficult than a normal dc. 1. Holding your yarn over the back and behind your hoop,insert your hook through the hoop. Yarn over your hook and pull through the hoop. 2. You will have 2 loops on your hook. After you have double crocheted around, join into the first dc with a slip stitch. Dc into the 1st chain space, 4ch. *1dc into next chain space, 4ch; repeat from * around. Do not join. When a pattern says to work into the chain space, this means to insert your hook into the hole underneath the chains and work your stitch around the line of chains. Dc into the 1st chsp, 5ch. *1dc into the next chsp, 5ch; repeat from * around. Lightly block the wreath, by gently wetting your wool and pinning it out to dry. Sew your bow onto your wreath. Hang by threading a loop of yarn around the frame. The mermaid tail was the very first pattern I wrote for Crochet at Play. As they do, a couple of errata snuck into the final version of the pattern, added to which folks have had some problems with the increases. Here is a version that is all nice and polished up and includes a crochet chart for the increases to help you along. New babies spend so very much of their time asleep, a sweet little mermaid tail not only keeps them warm, but makes for some adorable new baby photos. This is a warm, chunky yarn which makes this a quick project. The colour has hints of silver, making it sparkle like the sea. Work 14st and 13 rows in double crochet ribbing to measure 10x10cm/4x4in using 5mm hook, or size required to obtain tension. Work 2.5sts and 7rows in shell stitch to measure 10x10cm/4x4in using 5.5mm hook, or size required to obtain tension. Set Up Row: miss 2 stitches, 5tr in same stitch, miss 2 stitches, 1dc in next stitch. 5tr into dc from previous round. Insert your hook into the 3rd tr of the shell from the previous round , yo and draw up a loop. Insert your hook into the next dc, yo, draw up a loop, insert your hook into the 3rd tr of the next shell , yo and draw up a loop. yo and pull through all 4 loop on the hook. This sleep sack is as cute as can be, but also practical. The waist band is worked first in ribbing, then then the scallop stitch is worked directly onto the ribbing, first in rows then joined in the round from the top down. A series of increases and decreases are made for the tail, before stitching it closed and constructing the fins. Using smaller hook, make 10ch. Row 4: As Row 2. Do Not Turn. You will now start working in rounds, mark the start of the round with a stitch marker. Round 3 – 21: Work even in established shell pattern, making 1dc in the 3rd tr of the shell stitch from the previous round, 5tr into the next dc of the previous round. Round 23-24: Work even in established shell pattern. Round 26-27: Work even in established shell pattern. Round 29-30: Work even in established shell pattern. Round 32: Work even in established shell pattern. Finishing: Line up the tail so that the slit at the waistband is just slightly off to one side. Flatten. Dc the tail closed at the bottom. Do not break yarn. Work all double crochet stitches in the fin into BLO. Using larger hook, 21ch. Join wool at opposite side of end of tail. Repeat Fin rows 1-7. Do not break yarn. Slst the 2 halves of the fin together. Break yarn and weave in tails. The 2 buttons are sewn on aprox ½ inch (1cm) away from the edge on the end of the ribbing that does not have button holes. Use the buttonholes for a guide on the placement. The 2 sets of buttonholes, allow you to expand the waist of the sleep sack as the baby grows. The PDF patterns have step by step instructions for the stitches used at the back of the pattern. This pattern is part of Crochet Camp, a month long crochet extravaganza here on the blog! Head here to find out all about it and join in! Welcome to week 2 of Crochet Camp! This week is all about granny squares! Today, I am publishing the first of 2 patterns this week. This is the most basic of granny square patterns - showing you how to do single colour and multi-colour squares and then string them into bunting. Tomorrow, I will cover the basics of UK treble/ US double crochet and joining colours. Later in the week, we have another pattern that shows you another option for using your granny squares, plus we will be looking at some of the techniques and stitches you need to make a granny successfully. Don't forget to enter the giveaway for a year's subscription to Simply Crochet. Also, for those of you who had asked, the kits are back in stock. What to do with granny squares? The possibilities are endless, hey? Blankets, bunting, garments... How about a bag to get you started? Ali Campbell from Hooked!! A Crochet Addicts Blog and Get Hooked on Crochet has graciously agreed to share a lovely bag pattern with us. Ali is a crochet teacher extraordinaire. Ali started to teach crochet to friends a few years ago. When she moved to Dorset, she was fortunate enough to have enough space in the aptly named “Old School House” to dedicate a room in her home to being a full time Crochet Classroom, so she progressed from only teaching One to One classes to holding regular monthly workshops for up to 6 students to both beginners, improvers & intermediates, all of which have been well attended & 4 week workshops were regularly turning into 6 or 7 weeks! Ali runs the Crochet eLearning course, available as Course 1 – The Basics, Course 2 – The Next Step & Course 3 – The Finishing Touches . She is about as passionate about crochet as they come. She is also having a major operation today, so a massive good luck from me!! This post is part of a series for Crochet Camp 2013. Just joining in? See the FAQ here and the full list of posts here. *sniff* here we are in our final week of Crochet Camp. Hasn't it flown by? This week's main pattern is this set of fingerless mitts. This is the first pattern that we have done that is written in a more standard crochet pattern format. There are 4 sizes to choose from, and you will work through the instructions for your size by following the relevant set of instructions in brackets (re read the How to Read a Crochet Pattern post as a first step if you get confused). I really wanted to end with a pattern like this so that if you have ANY questions about this kind of pattern, myself and more experienced crochet campers can help you through if you get stuck. Most of the pattern is worked in puff stitch clusters. This is my favourite little stitch. I use it at least 3 times in my book and it is already in one pattern of book 2. Yes, "obsessed" IS the word you are looking for, but I don't care. In my mind, this is what I love about crochet - little round stitches that create a gorgeous texture and warmth. To make a puff stitch, place your yarn over your hook. Insert your hook into the specified stitch, yarn over again and pull through the stitch. Yarn over again, insert your hook back into the same stitch, yarn over hook and pull through the stitch. You will have 5 loops on your hook. Yarn over again, and pull through all of the loops on your hook. 1 Puff Stitch made. If you find you are snagging your hook and catching strands of wool as you work the Puff Stitch, try working a bit looser and try keeping your hook pointed down and the back of the hook pushing the top of the loops and yarn overs up as you go through. To make the puff stitch cluster, you will make 1 Puff Stitch, chain 2 and 1 Puff Stitch all in the same stitch. On your second and subsequent rounds, you will work your Puff Stitch cluster into the 2ch space in the middle of the cluster. Click to download the pattern now. Good luck and you know where to find me if you need me.